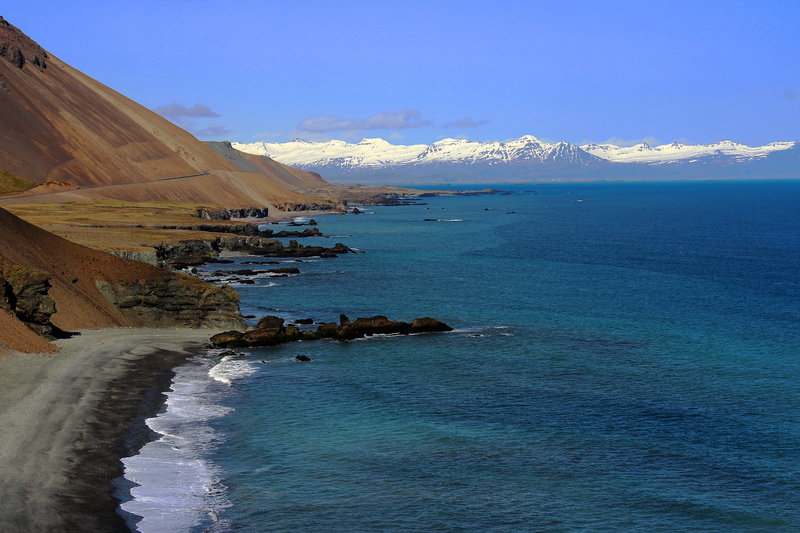 We drove for a couple of hours along the South Coast of Iceland after our exciting snowcat tour of Mt. Hekla. 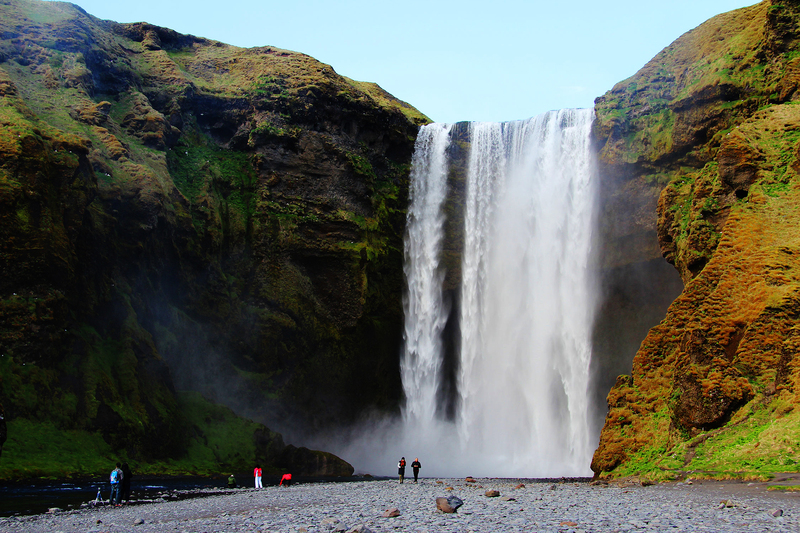 It was getting late, and we were tired, but we had to make a stop at yet another waterfall: Skogafoss. The early evening light made for some great photography. After getting some shots from the bottom of the falls, we made the strenuous climb up hundreds of steps to the top, which provided some great views looking from the falls out towards the ocean. Our evening “Stairmaster” really wore us out, so we decided to drive just a little ways further and stay the night in the charming coastal village of Vik. 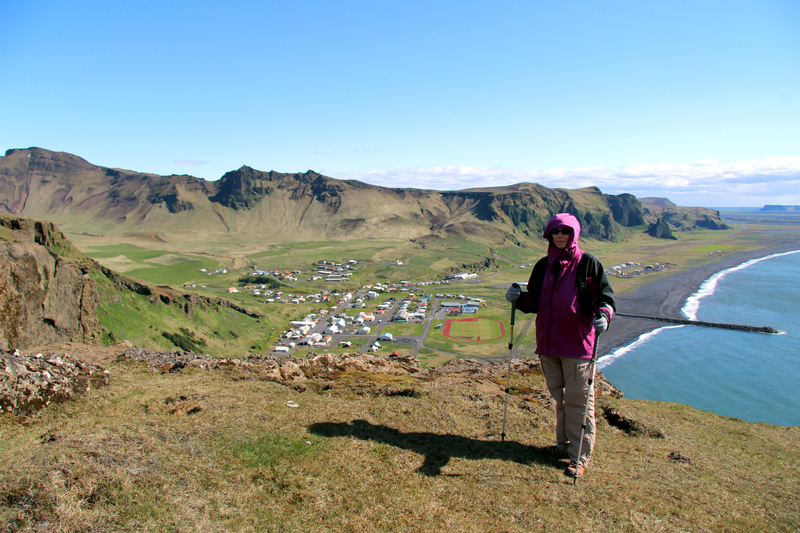 we decided to take advantage of the nice weather and hike up nearby Reynisfjall, a long narrow ridge that juts out into the sea. A short, steep climb up an old four-wheel drive road ended at the top of the ridge, where the views of the surrounding coast line were nothing short of spectacular. We followed the road to almost the end of the ridge, then looped back along a narrow, winding trail that follows the lofty cliffs that fall straight down to the sea a thousand feet below; this trail can be a little tricky if you’re scared of heights. We returned to Vik, gassed up the car, and headed down the highway to our next destination: Skaftafell National Park. 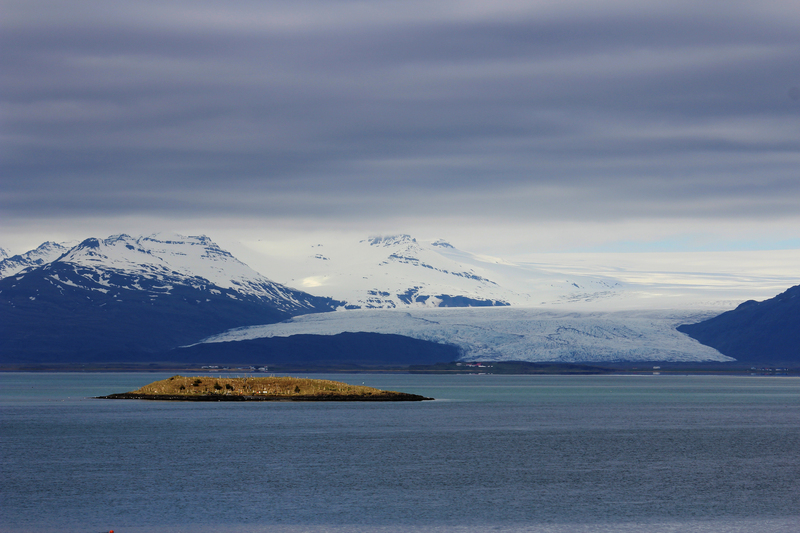 Before reaching the park, we were treated to stunning views of the Vontajokull Glacier, the largest glacier in Europe. From the main highway, the glacier looked like a vast white sea floating in space, with long glacial fingers stretching down almost to the coast. We arrived at Skaftafell in the early afternoon, where we threw on our daypacks and started walking into the interior of the park. 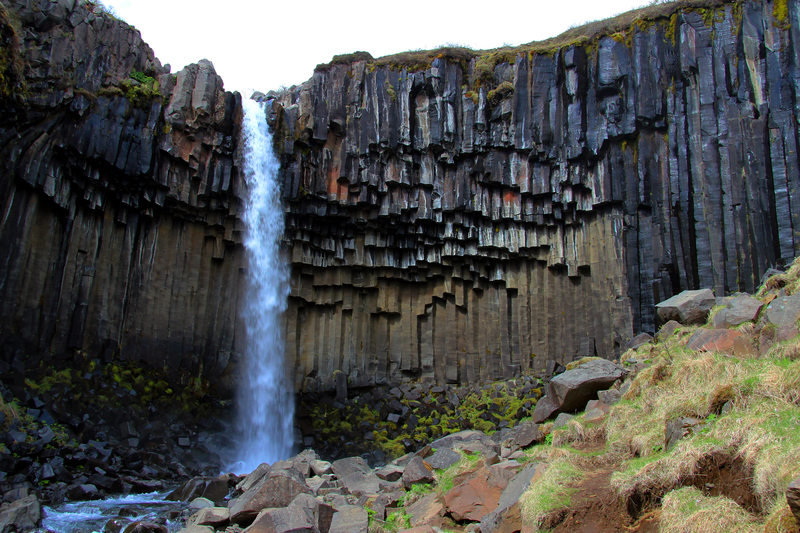 A nice four- mile loop hike took us to Svartifoss (“Black Falls”), a small, but beautiful waterfall that flows over a dramatic stack of basalt columns. Another mile or so brought us to a spectacular view of Skeidarajokull, a glacial tongue flowing from the main Vontajokull Glacier. After making a short side hike to the base of Skaftafellsjökull (Skaftafell glacier), we got back in the car and drove down the road to a guest house in an isolated part of the South Coast. After a wonderful dinner of locally caught Arctic Char, we settled in for the night as the weather started getting nasty. We awoke early the next morning with fresh snow on the ground. Before continuing our journey eastward, we backtracked a few miles to the Jokulsarlon glacial lagoon. 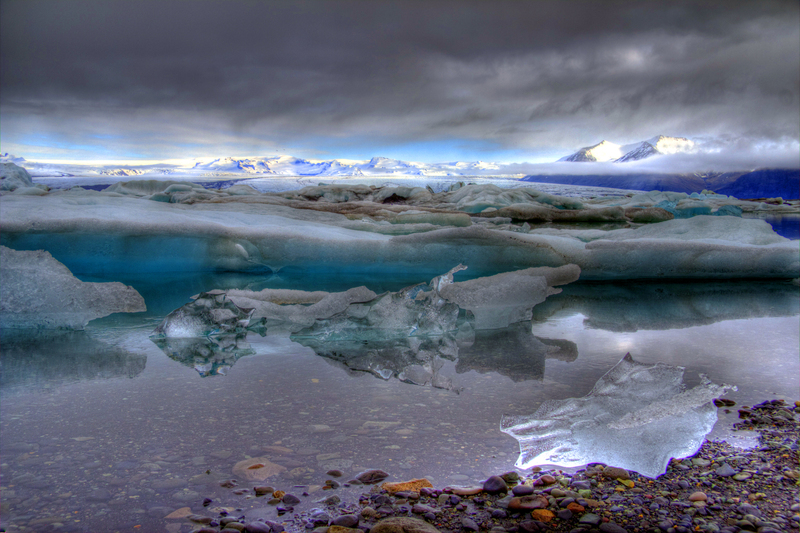 The lagoon is choked with surreal, blueish colored icebergs that break off from the nearby Breidamerkurjokull glacier. The scene was very quiet, serene, and eerie. Low clouds were overhead, with bright sunshine lighting up the distant glacier. Other than a lone photographer, we were the only people at the lagoon at this early hour. We spent a couple of hours walking along the shore taking photos and videos along the way. We walked along the outlet of the lagoon to the open ocean as the snow began to fall. 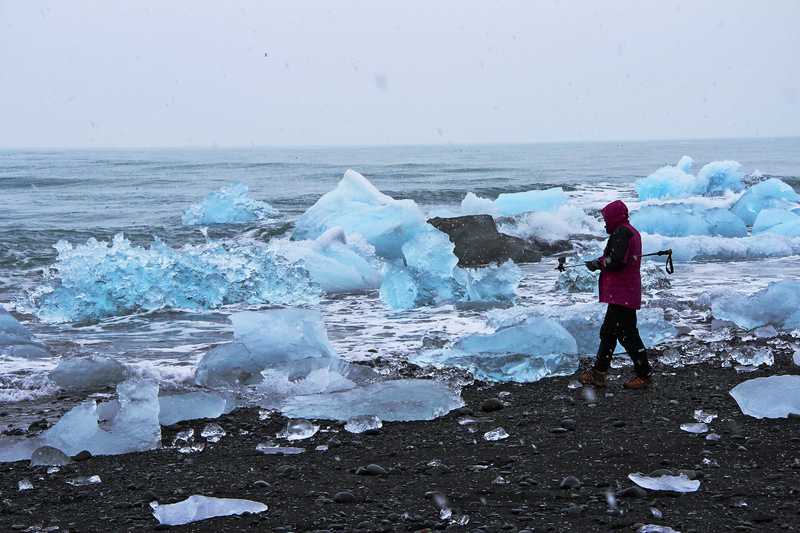 Out on the beach, waves crashed on the crystalline-shaped icebergs that had drifted from the lagoon out into the sea. After a quick breakfast, we packed our bags and continued our journey east. We made a long rest stop at the town of Hofn (pronounced “Hup”), where we picked up groceries and had a wonderful Lagoustine pizza for lunch. The drive east took us away from the glacier-covered mountains of the South Coast, to the dramatic fjords of the East Coast of Iceland. As the crow flies, it’s only about 50 miles from Hofn to our next destination, Eskifjörður. But here, the highways wind in-and-out of the fjords, extending the driving distance to 150 miles. There were multiple times where we would be driving along a fjord, looking longingly across the bay only a stone’s throw away from where we would be in an hour or so. Still, it was a sunny day and we just took our time, stopping at spots long the way to walk around and take pictures. 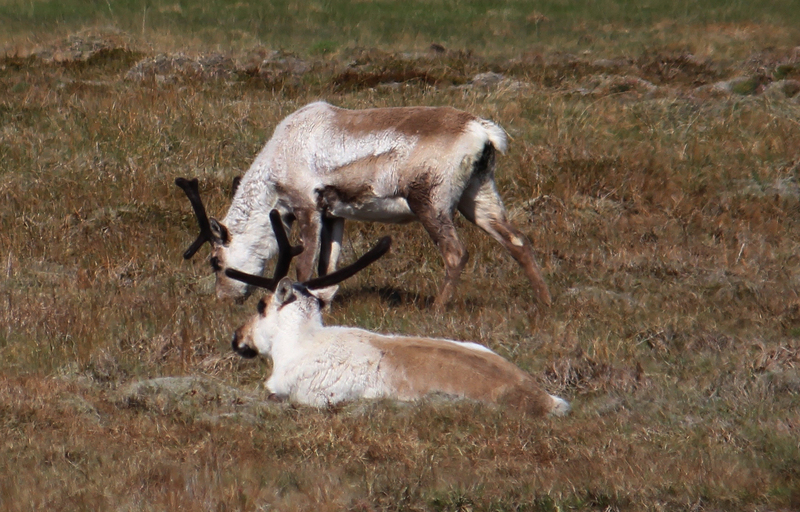 Just outside Hofn, we spotted a herd of reindeer enjoying the sunshine. 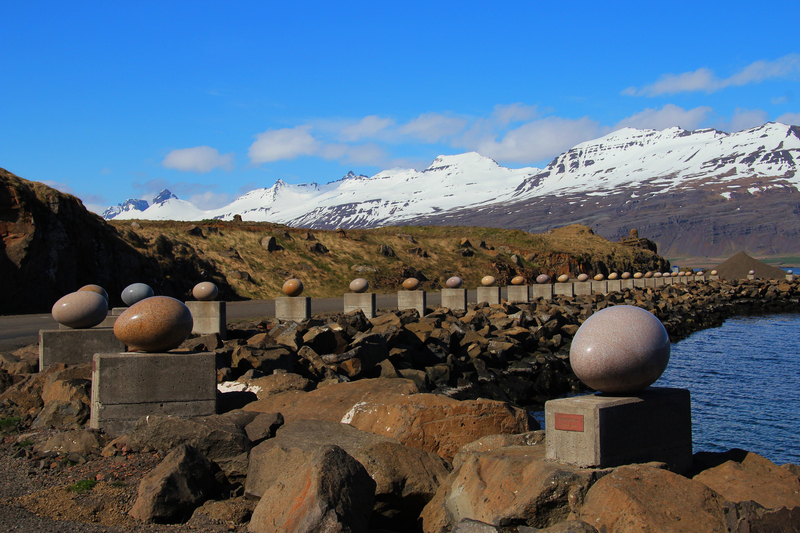 In the quirky village of Djupivogur, we came across someone’s interesting art project: Eggin i Gledivik (“The Eggs of Merry Bay”), a collection of 34 egg-shaped granite sculptures lined up along the jetty, all differing slightly in size, shape, and color. Each sculpture represents the eggs of all the main bird species found in the area. Around 6:00 PM, after our long drive around the eastern fjords, we arrived at the fishing village of Eskifjörður, where we would spend the next three nights. The apartment we rented was a bit unusual: The space is a former store front on the ground level, which made for a bit of a weird vibe. However, it was a big space with lots of curtains on the “storefront” windows for privacy. Large windows near the high ceiling provided beautiful views of the surrounding mountains. A few words on planning a road trip in Iceland: Where it was feasible, rather than change lodging every night as we progressed down the road, we would try to find strategically located accommodations, where we could spend 2-3 nights exploring an area in a serious of day trips. I believe this makes the trip a little less hectic as you’re not having to pack everything up each day. The exception to this was the South Coast of Iceland. It’s a large area with very few good locations to set up a single base for exploring without having to do long stretches of driving back-and-forth along the Ring Road. So, for this part of Iceland, we chose to pack up each day and move on. We were happy to finally arrive at Eskifjörður, where we could hang our hats for a few days. This entry was posted in International Travel and tagged Djupivogur, eastern fjords, Eggin i Gledivik, Eggs of Merry Bay, Eskifjörður, iceland, Jokulsarlon, reindeer, Reynisfjall, Skaftafell, Skaftafellsjökull, Skeidarajokull, Skogafoss, Svartifoss, Vik, Vontajokull. Bookmark the permalink.